The U.S. Grains Council recently participated in a USDA agricultural trade mission to India, led by new Undersecretary of Trade and Foreign Agricultural Affairs Ted McKinney. A delegation of livestock producers from Ecuador recently visited the Chippewa Valley Ethanol Co. plant in Benson to get a better understanding of dried distillers grains (DDGs) production. Bliss Baker, the president of the Global Renewable Fuels Alliance, recently responded to the IEA's latest World Energy Outlook by highlighting the clear need for the increased blending of biofuels in transport fuels. The Agricultural Utilization Research Institute has named The Chippewa Valley Ethanol Co. of Benson, Minnesota, its 2017 Ag Innovator of the Year. The award is the group's highest honor. 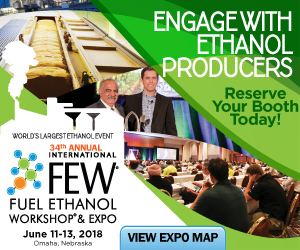 The U.S. EPA has approved an efficient producer pathway for Marcus, Iowa-based Little Sioux Corn Processors, allowing the facility to generate RINs under the Renewable Fuel Standard for non-grandfathered volumes of ethanol. Growth Energy applauds Reps. Donald M. Payne, Jr., D-N.J., and Ruben Gallego, D-Ariz., and 16 of their House colleagues for calling on U.S. EPA to increase the blending targets for cellulosic biofuels and biodiesel in the final 2018 RVOs. A new study led by researchers at the Department of Energy’s Joint BioEnergy Institute demonstrates the importance of microbial communities as a source of stable enzymes that could be used to convert plants to biofuels. Thirty-five students from Morris Area High School toured the 50 MMgy Chippewa Valley Ethanol Company plant Nov. 6 to get a better understanding of homegrown renewable fuel production. The tour was organized by the Minnesota Bio-Fuels Association. UNICA, the Brazilian sugarcane industry association, has announced sales of hydrous ethanol continued to increase during the final half of October, reaching a near record high of 839.63 million liters domestically. The Nov. 16 edition of the Capitol Hill newspaper Roll Call features a full-page advertisement placed by the American Coalition for Ethanol encouraging President Trump to tell the U.S. EPA to stand with rural America and protect the RFS. A Sandia National Laboratories-led team has demonstrated faster, more efficient ways to turn discarded plant matter into chemicals worth billions. The team’s findings could help transform the economics of making fuels and other products from biomass. The USDA has released the November edition of its Grain Crushings and Co-Products Production report, noting corn consumed for fuel alcohol reached 448 million bushels in September, down 7 percent from August, but up 3 percent from September 2016. The RFA says the PMAA's claims that underground storage tanks at fueling stations cannot legally store E15 are “grossly overstated” and the group’s conclusion that RFS volumes should be reduced is “completely unfounded." An announcement was posted last week on China’s Ministry of Foreign Affairs' website that the country would again allow U.S. distillers dried grains with solubles (DDGS) to be imported without charging an 11 percent value added tax (VAT).